Eat less and more fresh and move more – that’s the heart of spring & summer. Yes, the warmer weather is upon us, and this warm-up means great changes for your body. Learn how to live through this Seasonal Guide for Spring & Summer: What to Eat & How to Live. To everything, there is a season, including us. While we tend to be great at changing our wardrobe with the changing of seasons – we otherwise seem to be creatures of habit. We are stuck doing the same thing day in and day out. While there is some benefit to consistently – doing it year long is a more significant detriment than you would think. It’s not necessarily that your body craves change, but it needs it. Without change, at least periodically, you’ll probably see metabolic compensation take over. Metabolic compensation is the process for which your body figures out your life. It’s the judge or measure to how safe or threatened it feels. Over the long haul – it compensates to reach whatever level you are at, all in the name of survival. For example, if you eat fewer calories, your body will compensate for that and in time need fewer calories to survive. It’s all thanks to the tightly regulated homeostatic system revving 24/7 inside the body. While it’s not a bad thing, it’s also not wrong to push this system a bit, to keep it on its toes. That’s the way we were designed, to ebb and flow based on different seasons of life. If we’re honest, while we want everything to stay the same, yet change without our work, our body needs change to change. The best way to do this, in a healthy, safe and realistic way is to change with the seasons. To warm up with the warmer days, cool down with the cold weather and eat what’s in season. It sounds simple and yet something most skip over. The good news is I’m here to help. 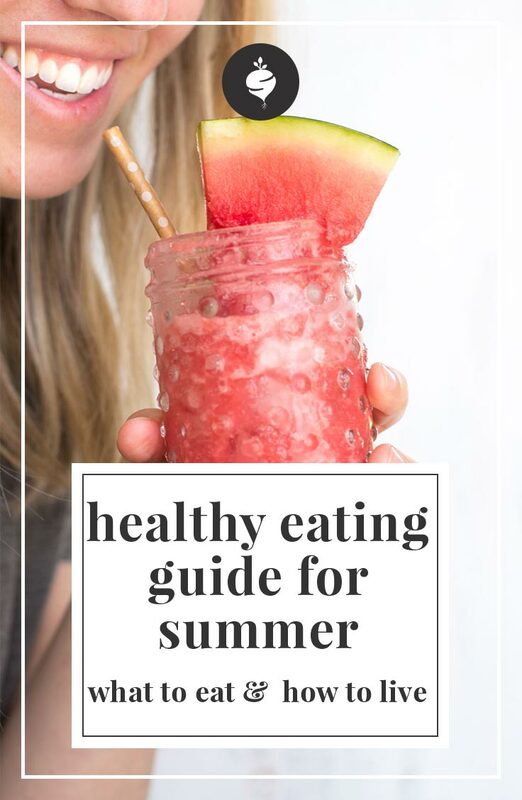 I’ve created a FREE download to give you the exact how-to on what to eat and how to live for the spring and summer season. Download that guide below. And don’t forget to learn the exact science on why seasonality matters here. You can snag the fall and winter guide here – so you have it when the seasons change again. Spring & summer are distinct seasons. We know that we can feel that between the moist, damp air that continues to rise in the spring, quickly shifting to the hot, dry, intense heat of summer. That’s why spring I’ll differentiate between spring and summer. So let’s start with spring. Spring is the season of new birth and new beginnings. It’s a season of renewal and growth. Interestingly, it’s also a time when our physiology senses a natural opportunity for a fresh, clean start making our bodies primed to lighten things up, cleanse ourselves of any accumulated imbalances and rejuvenate our deepest tissues. We are trying to reduce the weight and heaviness of winter – getting rid of unwanted items. Focus on clean, fresh produce items that are in season. Think bitter greens, berries, and fresh herbs like cilantro. Interestingly, all of the spring produce items are work together to help cleanse and purify the body of the excess toxins and fat stored during the winter month. Spring is also a great time to get rid of the excess in your environment. They don’t say “spring cleaning” for nothing. It is born into our physiology, this season of cleansing and renewal. Take time to get rid of excess at home and work and do a deep clean to spruce up your environment. As the heat of the summer approaches, it’s best to cool it down. Just like every season, we generally need to provide the opposite of what the season is. Which means in the hot, dry, predictable weather of summer we need to cool our bodies down and provide a sense of adventure. Summer is the time for staying cool, relaxing and finding a balance of mellow intensity. The focus for summer is to provide fresh, juicy produce items, keep yourself well hydrated and practice relaxing activities like reading a good book in the shade of a tree or soaking up some sun at the pool. Summer is a time for energy – use this to get things done, build on relationships and go on more adventures. Just make sure you provide adequate balance in rest and rejuvenation. Inside this free download, I share what lifestyle practices to incorporate and what foods to add. I also give you clues on what to skip for the spring & summer seasons. Click below to get your guide. Of course, I couldn’t leave you with a list of foods without providing some of my favorite fall + winter recipes. 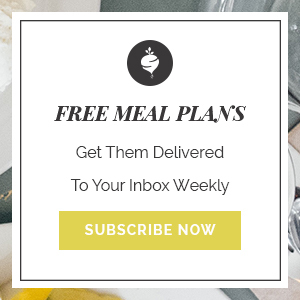 Recipes that will add spice, warmth, oil, and moisture to your body enhancing metabolism and satiety. Don’t forget to get the free download by clicking below. Don’t forget to subscribe to Simple Roots Radio to make sure you are notified as soon as another podcast comes out. Sometimes I can be a little slow to notify you, and this ensures that you get the show right on your phone to listen anytime you want! If you have some feedback to share or an exciting shout out on your journey, leave a note in the comments below. I would love to know your reactions to the show and how you’re taking steps in owning your own story. Finally, if you enjoyed the show, I’d love it if you’d take a minute to leave a rating and review. Through these reviews, we can work to make the show better and align more closely with the information you need to live your best life. It only takes a minute and makes a world of difference in the life of this show.